Lonely Planet’s number one destination for 2015, Singapore is a city-state in the Southeast of Asia located off the southern tip of the Malay Peninsula and is fast gaining popularity within the MICE industry for its exciting venue options. One of Southeast Asia’s largest aviation hubs, Singapore sees a dense network of flights operate nationally across Singapore and internationally to Europe, the Middle East, Australia and New Zealand. Though it has to be noted that over the past year a number of tragic aviation incidents have marred the regions air travel. Despite this Changi airport is one of the busiest in the world with over 100 airlines flying to 300 destinations around the world. Singapore also boasts an extensive local transport infrastructure with an impressive Mass Rapid Transit (MRT) system, 19,00 taxis and a sprawling network of double decker buses. The fastest way to zip around the city, the MRT has stations within easy walking distance of most of Singapore’s key attractions. If you plan on using the MRT alongside the frequent city busses that operate from 10am to 10pm at 10 to 15 minute intervals, you can buy a one day pass for S$10, two day pass for S$16 or three day pass for S$20 from the TransitLink Ticket Office or selected MRT stations. It is also worth noting that Singapore has an impressive number of public Wi-fi hotspots that visitors can register to use for free with their passport numbers at any Wireless@SG hotspot. After an $184m re-vamp the Suntec Singapore Convention and Exhibition Centre reopened in 2013 raising the benchmark for MICE venues. Featuring new hightech controls that allow delegates ‘real-time’ control over their surroundings and numerous sustainable environmentally friendly features, the venue was awarded ‘The World’s Leading Meetings and Conference Centre 2014’ by the World Travel Awards. Only 20 minutes from Changi International Airport and three MRT stations and centrally located in the Marina Bay area, the venue offers a number of flexible event spaces covering a total of 42,000 sqm. Versatile meeting rooms can be reconfigured to suit each event’s specific needs; a large inventory of modern equipment and furniture allow you to create a bespoke event space. Suntec Singapore is just as capable of catering for conventions with thousands of attendees with customisable conferences facilities for conventions and customisable halls with adjacent high-capacity loading bays for exhibitions. 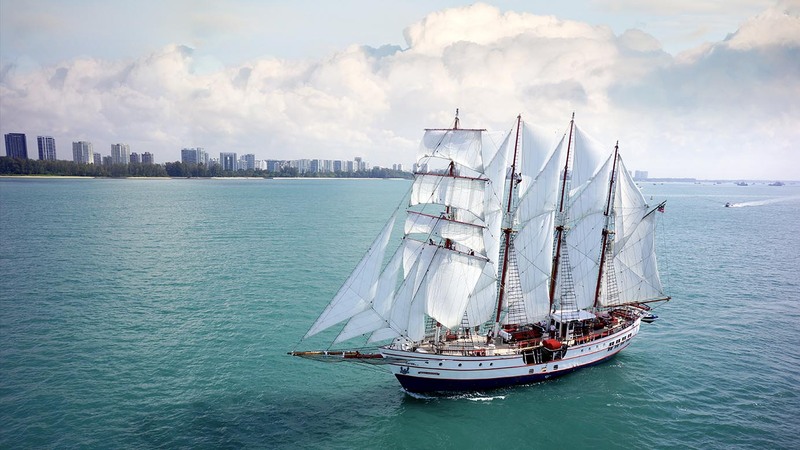 A luxury tall ship, The Royal Albatross is a unique multi-purpose event space for corporate meetings, presentations, product launches and incentives. Having undergone a complete re-vamp involving 360,000 man-hours, the Royal Albatross’ 22 sails and over 60,000 RGB lights really are an impressive sight and add to the rare and exciting experience of sailing on a luxury tall ship. 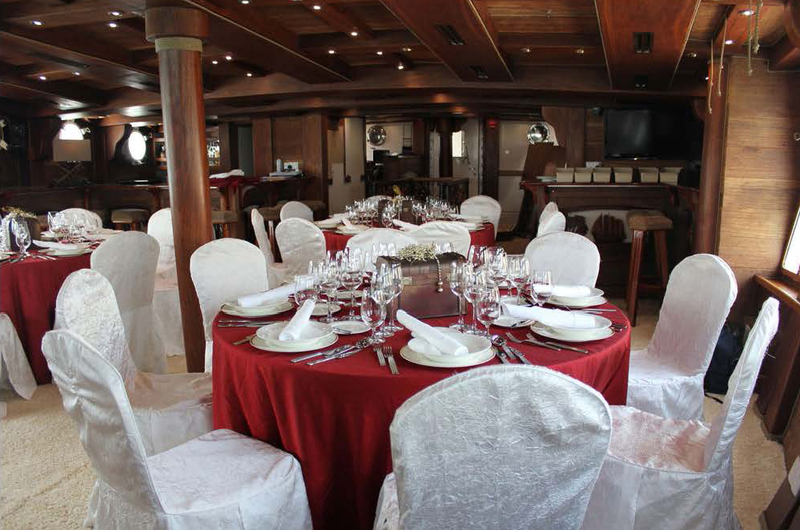 The Royal Albatross offers chartered voyages to Lazarus Bay, along the East Coast as far as Bedok Jetty or through the Southern Islands with space for up to 149 delegates for daytime and evening cruises with luxury accommodation for 10 VIPs to stay overnight. For events, The Grand Salon is a spacious fully airconditioned space with a raised state area ideal for up to 56 guests equipped with all the latest technologies including customisable lighting and audio-visual systems. The upper deck offers space for an additional 96 guests and with its rollaway awnings can be enjoyed whatever the weather. The rig and deck can be uplit with a specific colour scheme on request and has been designed to accommodate additional equipment for functions. Satellite communications also allow complete connectivity no matter the ship’s location! Located in the heart of Singapore’s ‘city within in a city’ the Raffles City Convention Centre is part of an integrated development comprising numerous modern amenities. Situated within such a buzzing hive of activity, the Raffles City Convention Centre offers the ultimate convenience located within walking distance of public transport links and hotels, shops and activities. The venue itself boasts more than 6,500 sqm of versatile event space with 27 meeting rooms that can cater for 100 to 600 delegates, not forgetting the building’s three magnificent ballrooms the largest of which can accommodate up to 3,200 delegates. A breath taking venue perfect for a whole host of corporate events, Raffles City Convention Centre also provides its corporate clients with the latest satellite conference system and a comprehensive range of equipment to create a productive and conductive meeting environment. Newly opened in 2013, The Westin Singapore is a luxurious business hotel located in the centre of Singapore’s Marina Bay financial district. Conveniently situated within walking distance of corporate event spaces, shops, restaurants and attractions such as the Marina Bay Sands Casino, delegates can enjoy the best of work and play. 305 exquisite guests room, including 16 suites, offer a relaxing space for delegates to rejuvenate after a hard days work. Unforgettable views of the surrounding area; floor-to-ceiling windows; impressive marble bathrooms; luxurious furnishings; and uninhibited high-speed internet access are all to be looked forward to. The Westin Singapore also offers 10 dedicated meeting spaces, which can accommodate groups of 10 to 80 delegates, including a 600 sqm ballroom with space for up to 560 guests. Voted one of the 20 top luxury hotels in Singapore by Trip Advisor in 2012, the Shangri-La Hotel invites you to enjoy a truly luxurious stay based around the fictional valley from James Hilton’s novel ‘Lost Horizons’. The Tower Wing – built in 1971 – with its imposing marble columns and beautiful mural of Shangri-La offers tastefully decorated rooms bathed in natural light with floor to ceiling. The Garden Wing, aptly named due to its 15 acres of surrounding tropical landscape complete with waterfall and ponds, the wing’s rooms reflect nature inspired interiors and each offer a balcony with table and chairs overlooking the pool. The exclusive Valley Wing has played host to heads of states and epitomize luxury with 131 rooms boasting a 24 hour personalised butler service. The hotel also offers state-of-the-art conference facilities equipped to deal with even the most demanding of events. Deemed one of Singapore’s most spectacular hotels with its iconic three towers joined by a boat shaped mast head, the Marina Bay Sands Singapore is located within one of Asia’s top destinations for business, leisure and entertainment. The hotel boasts a range of luxury rooms and suites with incredible views. Expect king size beds, spacious bathrooms, tasteful contemporary décor, executive work desks to ensure productivity and 42 inch TVs for relaxation. Rooms range in size from 39 to 79 sqm while suites from a generous 97 sqm to a whopping 629sqm. The hotel also has the world’s largest rooftop pool stretching 150 metres in length 57 stories above the ground. But the Marina Bay Sands Singapore is not just a luxury hotel with stunning views, it also offers delegates and corporate clients a range of hospitality. Each room ranges between a comfortable 85 and 96 sqm and is fully equipped with all the latest technologies. There is no shortage of day trips, incentives, team building activities and shopping centres in Singapore for business visitors to enjoy during their stay. Yixing Xuan Teahouse offers a range of tea making workshops perfect for 5 to 50 participants. Traditional Chinese tea making is renowned for is ambient and therapeutic effects so this workshop is a must for hardworking delegates looking for a bit of relaxation! Day Trips Take a break from the city and visit the surrounding islands where there are many incentive and outdoor team building activities on offer. Bintan Island – only 45 minutes from Singapore – has a whole host of activities where delegates can experience an adrenalin rush very different from that experienced in the boardroom with rock climbing, archery, water sports, high ropes course, go-karting, trekking and more. 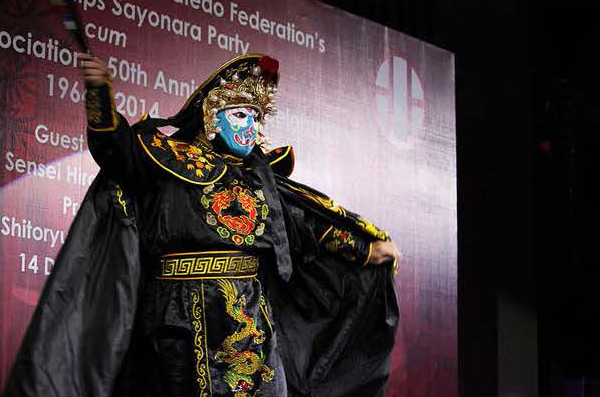 Singapore has an eclectic and exciting entertainment scene with inspired by both tradition and modernity. Scarlett Entertainment has an extensive roster of entertainment featuring all kinds of acts perfect for corporate events; from extraordinary circus performers that will dazzle and entertain guests at gala events, exhibitions and product launches to a mask change artist who offers a traditional and new style mask and costume change performance that will wow audiences! For more inspiration take a look at our incredible Singapore act roster! Located on the South coast of China, Hong Kong is a thriving cultural city with a population of 8 million. Renowned for its expansive skyline and deep natural harbour, Hong Kong has become a major hub for global trade and finance. Over 90% of the population use Hong Kong’s comprehensive public transport network. The main mode of transport is the city’s Mass Transit Railway (MTR), which runs both under and over ground carrying over 2.3million passengers a day to over 50 stations across the city. Running every two to 12 minutes from 6am to 1am it really is the quickest way to get around. Buses cover a vast area with a crisscrossing network sprawling across the city running at intervals of a few minutes. The city also has a huge number of taxis, the colour of which indicates which location it travels to though all of them service the international airport. Ferries are still very much relied upon to cross the harbour and connect the city with outlying islands, rewarding passengers with stunning views and a much faster commute time than buses and the MTR. Named the ‘World’s Best Airport’ eight times by Skytrax, Hong Kong International Airport offers direct flights to nearly every continent in the world with over 100 airlines flying to over 180 destinations everyday. Though smog is still a reoccurring problem is the city, that doesn’t stop its inhabitants enjoying the many cultural delights on offer. With influences from ancient China and its colonial connections, Hong Kong has a vibrant cultural scene: Asia’s top film festival, dragon boat expeditions, dawn taichi, Cantonese Opera and delicious cuisine full of mouth watering delights. Situated in the heart of Central, Espace is a versatile multi-purpose event space offers the ultimate in urban contemporary chic. With 4,000 sqft of customisable space including a 2,000 sqft Main Events Hall with flexible room partitions; 250 sqft Library Lounge with coffee bar; and 550 sqft Private Room for members only serving as a luxurious cigar room. Each room comes with state-of-the-art amenities and modern high-tech facilities including HD projectors, programmable lighting, screens and AV systems designed to cater to even the most demanding of events. Conveniently located adjacent to the Central MTR exit and within walking distance of Hong Kong’s premiere business buildings, shopping malls, restaurants and hotels, Espace is an impressive event space perfect for conferences, meetings, exclusive launches and exhibitions with outstanding connections to the city. A favourite event space for corporate clients planning exhibitions, conventions, meetings and banquets, the Hong Kong Convention and Exhibition Centre has a wealth of purpose-built facilities located right on Victoria Harbour. It has 52 meeting rooms, two theatres, two convention halls, five exhibition halls and several pre-function areas that can hold a total of 20,000 delegates. Event professional will benefit from the centre’s 800 plus staff who are on hand to ensure smooth pre-planning and that everything runs without a hitch on the day. The centre also boasts an impressive range of modern facilities including state-of-the-art-lighting, stage rigging provisions, an advanced simultaneous interpretation system and seven world-class restaurants. Connected to two world-class hotels, the Grand Hyatt Hong Kong and the Renaissance Harbour View Hotel, the Hong Kong Convention and Exhibition Centre has the best of luxury amenities and world-class MICE facilities. This five star hotel is renowned for its impressive conference and meeting facilities and has built up a reputation of excellence for facilitating productive events. With stunning views overlooking Victoria Harbour, the Mandarin Oriental Hong Kong offers a stunning business event location. Equipped with state-of-the-art lighting systems, presentation equipment, ceiling suspended projectors, large LCD screens, high-speed Wi-Fi, video conferencing and expert staff on hand to iron out any technical hitches, the Mandarin Oriental offers the best in technical support. 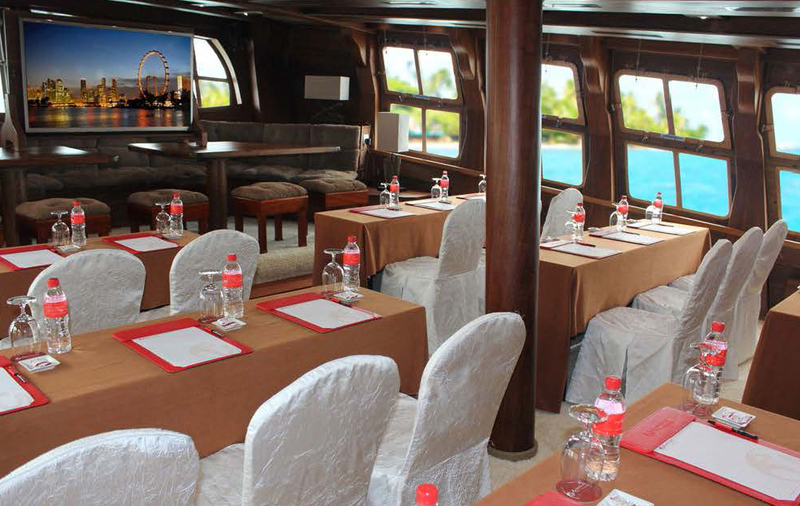 The venue has several dedicated meeting and event rooms that can be adapted to cater to all manner of events. The Connaught Room is comprised of six different rooms that can be combined to create an elegant ballroom for 600 people; The Chater Room is a spacious modern space with views over the harbour and can be divided into four smaller rooms with adjustable wall panels; the East and West rooms on the 23rd floor are perfect for boardroom meetings and private dining though they can be combined to accommodate larger gatherings. One of Hong Kong’s most unique hotels, Mira Moon takes its design inspiration from a legend in Chinese mythology about the moon goddess of immortality; characters from the story are represented throughout the venue with antique Chinese fabrics and prints. Combining modern amenities and Chinese tradition, this unique 91-room hotel is a fantastic place to stay for those looking for inspirational surrounds. Each room boasts an impressive range of modern amenities, whilst the addition of a 24-hour fitness centre, tapas and cocktail bar and private Secret Garden venue, make this stylish and unique venue a truly luxurious place to relax after a hard days work. Just 15 minutes from Central and 35 minutes from Hong Kong International Airport, Langham Place offers 5-star luxury accommodation in the vibrant area of Kowloon. The hotel boasts 666 rooms and suites spread over 42 levels, a stunning relaxation space, 24 hour fitness studio and four world-class restaurants offering visitors a special dining experience – including Ming Court serving Michelin Star Cantonese Cuisine. Not forgetting, the 20 metre rooftop pool where guests can relax and enjoy uninhibited views of the city! Extensive and innovative meeting and event facilities are also on offer for those that like to mix work and play, with five flexible meeting spaces for 480 to 800 people. Occupying floors 102 to 118 of the International Commerce Centre, the Ritz Carlton, Hong Kong is located in Hong Kong’s tallest and the world’s eight tallest building standing at 484metres high. It boasts 312 guest rooms with spectacular views of Victoria Harbour as well as six dining venues. Guests can also pamper themselves at the hotel’s idyllic spa or enjoy a session in the indoor infinity pool or state-of-the-art fitness centre. Corporate groups also have the opportunity to take part in some unique teambuilding activities (‘VolunTeaming’) as part of the hotel’s social responsibility programme. Activities such as tree planting offer team building with a meaningful contribution and are a fun alternative to the traditional. Hong Kong boasts many unique and unusual experiences that make for a completely unforgettable trip to this incredible city. One of the world’s oldest trams will deliver you to this oasis of stunning vistas, great shopping and dining, nature walks and unique collection of attractions. 552 metres above sea level, Victoria is Hong Kong’s highest mountain and a must visit when staying in the city. It is a little known fact that in addition to the main city Hong Kong is made up of 260 sprawling islands. Delegates can hire a ‘junk’ – a traditional Chinese fishing boat – and explore these overlooked islets and enjoy the views of the rugged coastlines and deserted coves. 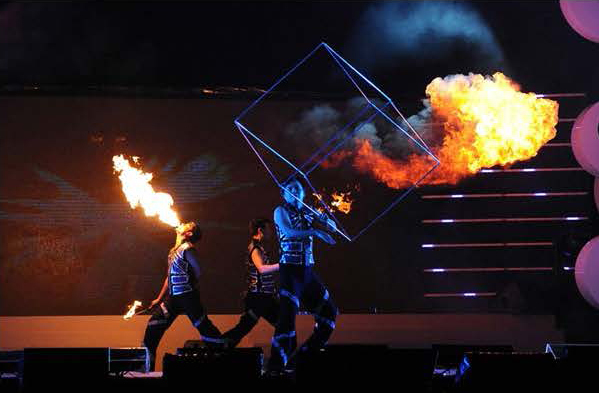 Hong Kong has a whole host of world-class entertainment perfect for not just corporate events but corporate team building days as well. Our troupe of professional Chinese circus performers offers a menagerie of traditional acts including martial arts performers, drummers and dragon and lion dances perfect for event that demand a wow-factor spectacle. 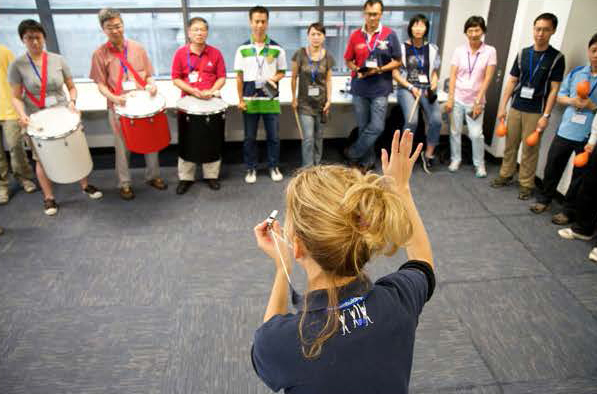 Whilst our Hong Kong based Asian team building specialists have a whole host of unique activities that will really engage and excite delegates including: boat building and racing, large-scale art, music workshops, and nail-biting 60 second challenges.